O just had her first appointment at the Ophthalmologist in a while (since November I think). This was actually only her third visit. If you recall, her first trip was quite an ordeal as far as cooperation goes. But we learned lots, got her script and ordered the glasses. 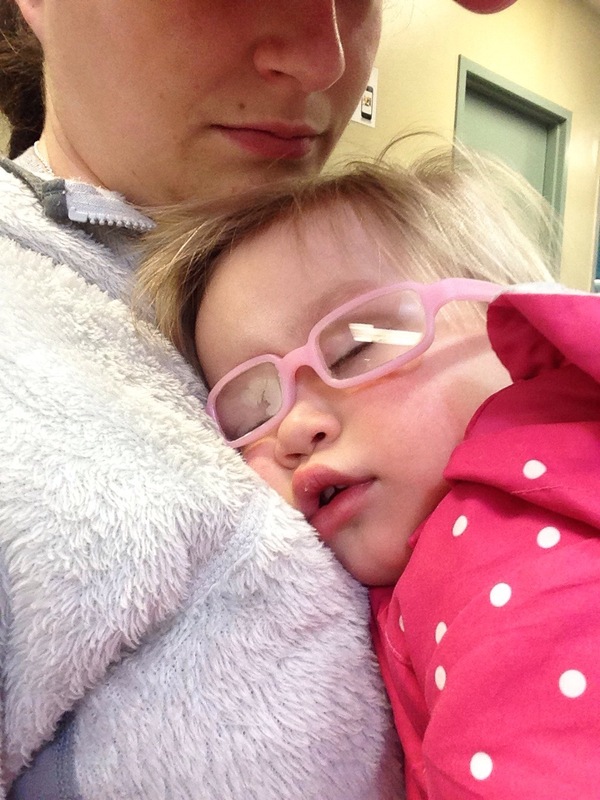 I wrote a post on all that we had learned about O’s prescription, condition and what exactly happens during the vision examination of a toddler here. Her second trip was to evaluate the effectiveness of her prescription and explore the possibility of patching (which we were instructed to do 4 hours per day on the right eye). After a few weeks of patching, we found that her other eye crossed and were told to scale down our patching hours and alternate eyes. That happened nearly in tandem with the free replacement of O’s Miraflex frames due to significant fading. I wrote about both here. At this appointment we were there to see how well her left eye had been responding to the patching of the right eye. O had been patching since November and we had been told over the phone (not an actual visit with the doctor) to scale down and alternate patching. By the time we visited the Ophthalmologist this week, we had taken patching to one hour per day on the right eye (to exercise the left) and patched the left eye only on an as-needed basis. The doctor was thrilled with the results! O’s left eye had responded extremely well to patching and we will continue to patch the right eye 1 hour daily with occasional patching on the left. He did say to increase the occasional patching on the left eye to 2-3 hours when we do decide its needed so that it’s just a little more effective. This is all good news! Basically, the brain is choosing to use the left eye almost as often as the right and has been learning not to favor one eye over another. This way, both eyes are being used fairly evenly and are therefore working together with each other as well as the brain. Because the brain is choosing to use both eyes so often, then the muscles that keep O’s eyes straight are working hard and staying strong. Since those muscles are being used then they aren’t getting weak! So it is unlikely that O will have a “lazy eye” or Amblyopia. See, this is not just a vision issue… It’s a vision, muscular and neurological thing. And we need to get that trifecta working together in perfect harmony. Um, kind of like juggling… or a symphony. By the way, my kid was completely cooperative and happy during every moment of the appointment. The nurses were shocked at her impeccable behavior and I was proud. I kind of felt like a magician. Wanna know how we got O to be a perfect angel for all of this? Well, since our past appointments were tough on her as well as us, we started prepping her a few days ahead. We talked about going to the doctor and all the things we will do there. She showed me how she would put her glasses on/off to let him see her eyes and I talked about how she might get to see a flashlight so he can look in her eyes. She was especially excited when we reminded her of “the puppy”… our doc has a stuffed animal in the corner that barks and moves when he flips a switch. It is used to get kids to look in a particular direction and focus on things at a distance while he examines. But we were worried that practicing just wasn’t enough. Considering that each time we had been there before, not only had O cried but so had I; we needed motivation. Let me tell you something about our little O: she’s quite determined. Tell her she can’t do something? She will. Remind her that she can have dessert after those green beans are gone and she’ll shove all of them in her mouth at once. What does O love more than ANYTHING in the whole wide world? More than m&m’s, more than puppies, more than shoes, more than going to school to get Z? Donuts. We may or may not have bribed our kid with donuts. With the simple mention of donuts she actually couldn’t wait to get to her appointment. And as soon as we walked in, she told the nursing staff, “I go to the donut store”… and each time the doctor was finished with one portion of the exam she would say, “All done! Go to donut store now please?” and she didn’t forget. She didn’t let us forget either. We talked about donuts non-stop, on repeat for the whole exam, all through check out, into the car and while buckling. We had a 10-15 minute drive to our old neighborhood in town where we get coffee and see our friends. All the way there, “I so excited! Go to donut store!” All. The. Way. There. There is only one place this family buys donuts. Busken Bakery is our jam. The headquarters/commissary is just a block from our old coffee shop. O knew where we were as soon as we pulled in. She clapped with excitement and fought to get out of her carseat faster than I could unbuckle her. The absolute best thing in the whole world is witnessing the look of shear joy on your own child’s face. In fact, it makes me forget the 9 months of morning sickness and 3 days of labor… for like a minute. When we walked into Busken, O radiated sheer happiness and politely ordered “My donut, please,” as if the woman behind the counter knew how long she had been waiting for it and how well behaved and brave she had been this morning. Like that lady had been waiting all day long for her to walk in a reward her with that heavenly donut. 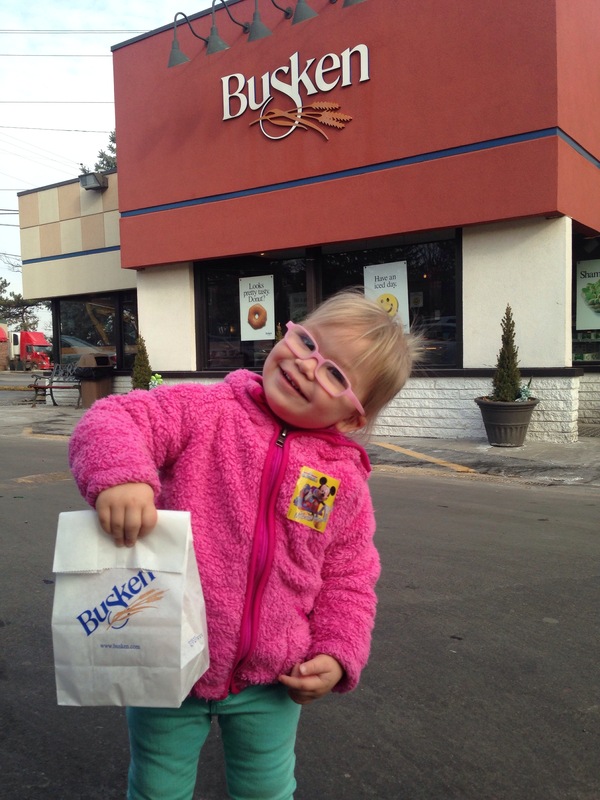 She even got her own bag for her very own donut. Pssst- We only let her eat half today after telling her it was gone. So there is more in the bag to surprise her with tomorrow. At any rate, we are proud of our little O for being so good about keeping her glasses on and even asking for them every morning when she wakes up. She is a trooper when she has the patch on and a tough cookie when we take it off (like a band-aid… ouch!). And boy, oh boy does she rock those little pink rectangular frames… everyone thinks she’s a little fashionista with her skinny jeans, hipster frames and ponytail! I’ll leave you with this picture of O napping during Z’s soccer practice the other day. How funny is her squishy face? She slept like that for an hour in a noisy gym. I enjoyed every moment of her on my chest. Way to go…O!!! And Lindsey! And Rob! Love following you on Hildagotrocks.